Home » Science & Technology » Will airlines ban Samsung phones after their recall for exploding batteries? 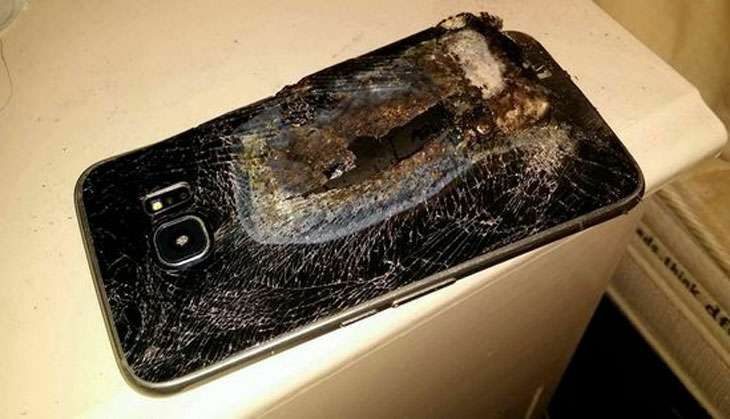 Will airlines ban Samsung phones after their recall for exploding batteries? Samsung's release of its latest phone, the Galaxy Note 7 has turned into a financial and PR disaster with the halting of sales of the phone and recall of millions of phones that have been sold so far. The problem has been with batteries on the phones catching fire although Samsung's statement only alludes to their being a "battery cell issue" and that only 35 cases have been reported so far. For Samsung, the recall couldn't have come at a worse time. Apple is due to release its new iPhone, also likely to be numbered the 7, this week and Samsung was hoping to steal some of the news spotlight with its massive presence at the Berlin IFA consumer electronics show that is going on at the same time. Exploding phone batteries is not a new thing and they are not confined to Samsung's phones. There have been many reports of previous phones that have spontaneously burst into flames, in some cases unfortunately injuring, and even killing the carrier of the phone. Even iPhones have suffered this problem with at least one case occurring as a result of impact when a mountain bike rider fell of his bike and landed on his iPhone 6. Smart phones have batteries that work through the use of lithium ion. These batteries have the advantage of being quick to charge and producing a lot of power in a compact, lightweight format. The problems start when chemical reactions occur, through overcharging, impurities in the battery or through a sudden impact, and the battery starts to overheat. Unchecked, the heat causes the reactions to go faster causing more heat, resulting in "thermal runaway". Once the temperature hits 150 degrees Celsius, things proceed until the battery, and phone, catches fire. A particular issue for the Samsung Galaxy Note 7 is that it uses a USB type C socket for its power charging. Using nonstandard USB to USB C adaptors and even USB C cables has been shown to beextremely risky because of the possibility of putting too much voltage into devices and essentially "frying" them. Using such an adaptor may have been the reason behind at least one of the Samsung Galaxy Note 7 fires. Exploding batteries have been common in cheaper "hoverboards" which caught fire on charging. But even shipping batteries can end in disaster with the fatal crash of a 747 UPS plane beingblamed on its cargo of lithium ion batteries catching fire. The risk of phones and their batteries catching fire has raised the issue of safety of electronic devices on domestic aircraft. The crew of an international Qantas flight recently, had to extinguish a fire in a seat that was caused by a phone that was crushed after the passenger who dropped it into the mechanisms, moved the seat in an attempt to retrieve it. The airline explicitly warns passengers about this scenario in its safety video. It is also common for airlines to restrict the carrying of spare batteries on flights to carry-on luggage. The US Federal Aviation Authority are specifically concerned about spare batteries that have exposed terminals that could potentially short circuit through coming into contact with other metal in a bag. The external portable phone re-chargers are less of a problem because they don't have these exposed terminals and so don't present so much of an issue. Most airlines have already also banned hoverboards from being taken onto flights. It didn't take many confirmed incidents of hoverboards catching fire for this action to be taken. Given that Samsung has explicitly declared that its Galaxy Note 7s suffer from the same issue, and the number of reported incidents is similar to that of the hoverboard, it would not be unreasonable for airlines to take the same precaution with the specific Galaxy Note 7 phone. The problems with airlines trying to do this in practice however would be significant. Hoverboards were far more obvious to spot than a particular make of phone and the danger presented by the Galaxy Note 7 would largely disappear after the recall has taken place. Telling a passenger that they are not allowed to take their phone onto a flight would present a far greater public relations challenge than stopping them take a hoverboard. One has to assume that people who have bought a recalled phone will be sufficiently motivated to exchange it as soon as possible in any event. This would make the relative risk to airline flights over the coming weeks extremely low. Given that other stories of exploding phone batteries have not affected phone sales previously, it is unlikely that this issue will impact Samsung in the long run.